As some of you may know I have a sweet tooth. I can’t go without having dessert after dinner. I love experimenting with different things. I wanted to try and make a peanut butter cup but instead of using peanut butter I went ahead and used Trader Joe’s cookie butter. 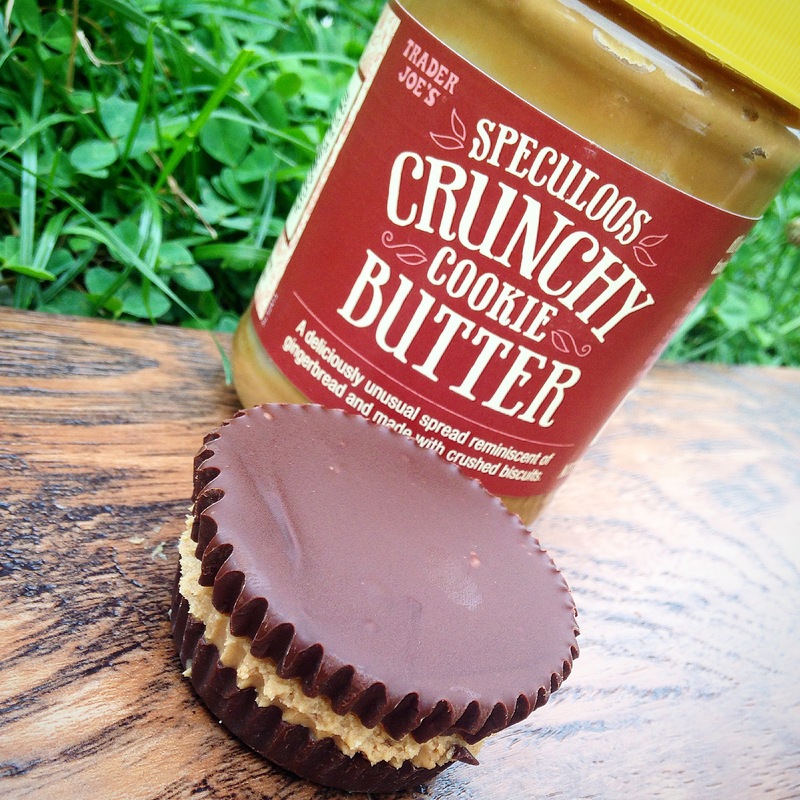 If you haven’t tried cookie butter you need go out and get it right now. Anyway the filling is cookie butter and some graham cracker crumble. My kids enjoyed this so much they even dipped it in milk. I hope you enjoy. This would be a great idea to make mini ones for birthdays or even for gifts. Line 6-12 muffin tins with paper cupcake liners. Melt the chocolate chips on a double boiler. Next distribute 1 tablespoon or a cookie scooper of melted chocolate into the bottom of the trays. Bang the tray on the counter so it flattens and becomes nice and smooth. Place in the freezer for 15 to 20 minutes. Next with an electric mixer, mix cookie butter, sugar and butter. Blend until smooth. Take the tray out of the freezer and add the same amount of cookie butter as you did with the chocolate in the trays and sprinkle graham cracker crumble. Bang on the counter again. Place in the freezer for another 10 to 15 minutes. Repeat final step with the last of the chocolate. Finally place back into the freezer for another 15 minutes. Enjoy with a glass of milk, coffee or even some wine.